It’s superior to Top Gun. You may have seen the many parodies to the final scene, but An Officer and a Gentleman is far more powerful. Nowadays, Richard Gere seems to be an older woman’s heartthrob (see The Second Exotic Marigold Hotel) and we forget these outstanding performances that should place him on a par with Pacino. Released in 1982, pop music and big hair can be a little jarring, but it’s a testament to an era that seems to have all but vanished. Sadly, this type of heartfelt tale only exists in independent and foreign cinema today as Hollywood opts for either the big blockbusters or teeny indie hopefuls. Clearly, this is an enormous loss. Boldly, An Officer and a Gentleman begins as a shaggy-looking Gere, playing Zak Mayo, looks upon his aging father (Robert Loggia) lying strewn on the bed. Prostitutes surround him and a stench of alcohol lingers in the air as he looks upon his father and gazes at himself in the mirror. His mother committed suicide after Dad left her to hold the baby and he’s had to pay the price for both tragedies. Mayo, without saying a word, refuses to turn into his father. Instead he joins the Navy with the specific intention on becoming a jet pilot. 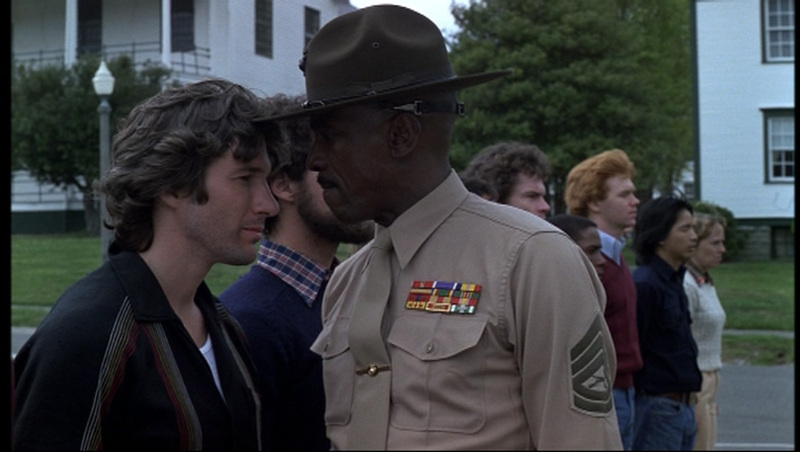 Marine Gunnery Sergeant Foley (Louis Gossett, Jr. preceding Full Metal Jacket’s Hartman) mocking, criticising and putting him down is to be his mentor. A cocky little fellow, Sid Worley (David Keith), whose brother has died in Vietnam becomes his best friend, and at a dance both recruits meet the love of their lives, Paula (Debra Winger) and Lynette (Lisa Blount). Mayo and Sid pair up with the flirty and feisty duo, as the couples make out in cars and rent motel rooms to enjoy heated moments of passion. Paula becomes Mayo’s lifeline, and proves how he can love and be loved. We wonder whether he will graduate and become the Officer his father tells him he cannot be. Critic Mark Kermode correctly asserts that An Officer and Gentleman is “not a romantic movie, it’s actually a movie about blue-collar, down-trodden people”. While Top Gun’s Cruise and Kilmer play volley ball, Richard Gere is a man without a home; a lone wolf desperate to prove to himself he can be a better man. Taylor Hackford directs a simple story as it is merely two military men falling for two cardboard-factory working-class women. Tender love scenes are intimate and heartfelt, as Paula and Mayo tentatively find out about each other’s tough lives. Mayo may be a “strong, silent type” but we see the hidden cross he has to bear: his abusive father; his isolation; his fear of failure. Even Sergeant Foley, initially a bully to the recruits, is chipped away at. By the time we get to the end, we appreciate and champion him. Therein lays the key. Foley, on introduction, is the villain. Foley is who intimidates and breaks Mayo down. Sneaking shined buckles and shoes into the dorms, it is Foley who Mayo fears. The intelligence in Douglas Day Stewart’s script is how, by the closing credits, we realise that the villain is our own personal fears. All the supportive characters equally have private challenges: Perryman (Harold Sylvester) and his desire to provide for his family; Della Serra (Tony Plana) and his keenness to meet a woman; memorable Seeger (Lisa Eilbacher) who’ll be leaping over walls of oppression throughout her career (if there was a sequel, it is her story I’d like to see). Broken families torn by silent men and resigned women is a reoccurring theme. An Officer and a Gentleman, apart from an expert use of foul language (the entire audience at the BFI gasped on multiple occasions) depicts actual issues told through military metaphor. The likeable and relatable characters, fully fleshed out, mean that we’re drawn into their plight. Touching upon suicide, abortion, abuse, macho-pride, sexism and gender, it is delicately handled, something proven by how An Officer and a Gentleman is considered a romantic movie. Clearly, a precious love exists on screen, but Hackford’s eloquent and finely wrought drama is ripe and rich, with detailed characterisations that Top Gun only dreams of. BFI LOVE runs until 31 December 2015 at BFI Southbank and various venues across the UK. To find your nearest LOVE event visit www.bfi.org.uk/love.